Twitter is expanding its advertising system in a move that will likely frustrate some of its users. If you use the service, you are probably familiar with Promoted Trends and Promoted Followers — both of which appear in the sidebar. Companies can choose specific words or hashtags to automatically appear at the top of the trending topics list along with a tweet to explain it in more depth. They can also just decide to promote their own Twitter account in the “Who to follow” section. Now there is a third option: Promoted Tweets. These new ads will show up at the top of your timeline with a “Promoted” symbol underneath. They slowly move down the timeline as users you are following post new tweets. I am sure Twitter knew backlash is imminent for these obtrusive types of advertisements, so there are some conditions. Promoted Tweets will only appear from a company or organization if you are following the official account. So if you do not follow any business-related accounts, you should not see any Promoted Tweets. Also, you can dismiss an individual tweet from the timeline once you have seen them. So when we decide to follow a favorite brand, business or charitable organization, we expect to be among the first to get a special announcement, access to exclusive content or a great offer. That’s why starting today, we’re introducing a way to ensure that the most important Tweets from the organizations you follow reach you directly, by placing them at or near the top of your timeline. I do not think Twitter stepped out of their boundaries at all with Promoted Tweets, so I do not expect much backlash. Problems will arise if they ever decide to place sponsored tweets in the timeline from companies that users are not following. But until then, this is tolerable. 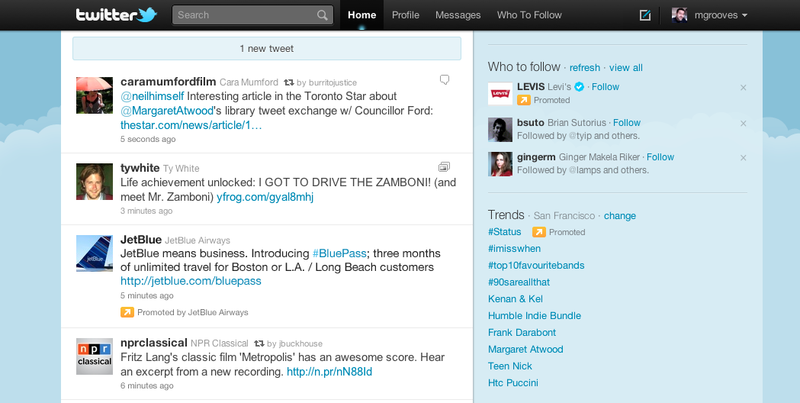 Twitter is beginning to roll Promoted Tweets out with a small group of partners such as Dell, Groupon, and Redbull. The list of companies will expand over time.